Ever wanted to design your own glass? 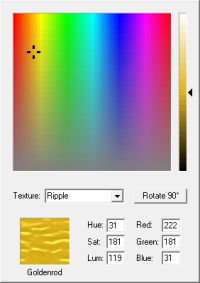 Now you can apply a texture to any of the 16 million Windows colors. Choose from among the fifteen textures that come with Glass Eye 2000, or replace those textures with your own. Textured color is available in all editions of Glass Eye 2000. Below is an example of each of the fifteen textures applied to the color "goldenrod." Each texture can be rotated to the orientation you want.